Stony Brook, N.Y. - Stony Brook head men's lacrosse coach Jim Nagle announced that Zach Oliveri has accepted a grant-in-aid offer and will join the Seawolves in the fall. Oliveri, a transfer from Massachusetts, will have one year of eligibility. "We're excited to welcome Zach to the Seawolves family," Nagle said. "Zach brings a wealth of experience to the goalie position. He was a terrific player at UMass and will provide our team with experience and wisdom." After redshirting as a freshman, Oliveri started 43 straight games, registering a 9.48 goals against average and a .532 save percentage. He posted 21 career games with 10 saves or more, including 15 in a 10-9 loss to Albany, the nation's top scoring team. As a redshirt freshman, Oliveri finished the 2013 season with a 8.63 GAA and a .559 save percentage. In the second game of the season, Oliveri made 18 saves in a 12-11 victory over No. 4 North Carolina. 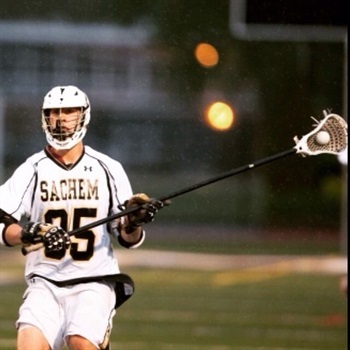 Oliveri starred at nearby Connetquot High School, earning US Lacrosse All-America honors. A top-100 recruit and top-15 goalie, Oliveri was the starting goalie for the USA U19 team that won a gold medal in Finland in 2012. Stony Brook returns eight starters and 30 letterwinners from a team that went 13-5 and advanced to the America East Championship game. assuming this soph has 3 years left, he is in 2019. High School: a 2015 graduate from Syosset High School... three year letter winner for the Braves... earned All-Conference in '14 and '15... was apart of the 2015 LIC champions and state semi finalist... also apart of the number two ranked team in New York and number ten in the country... was a four year letter winner in football playing tight-end and outside line backer... earned All-County in football in 2014.
he might have taken a year off to do some volunteering abroad, cant figure it out. might have been through the university. if so, great. also I read that he originally committed to SB for football, not sure if he's trying for both. According to Calabria, the key to these impressive wins is simple: team defense. Calabria points to the efforts of close defenders E.J. Aronson and Dave Reiter and short-stick defender Michael Elardo. Elardo blanketed Massapequa's Ryan Tierney (Hofstra), while Aronson was responsible for covering Paul Dilena (Marist). Reiter is the overall leader of the defense, Calabria said.